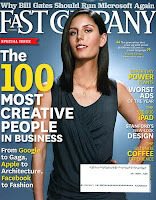 In it's June 2010 issue Fast Company published it's annual list of the "100 Most Creative People in Business". I expected to find it of interest after there being tons of good content (and people covered) in the 2009 iteration (posted about and linked to here) and found that this issue didn't disappoint. One interesting thing about the content is FC made the editorial decision to not feature anyone that has been previously profiled in the magazine (much less a prior "100 MCPiB" type person). #17 - Reid Hoffman - Founder and Chairman of LinkedIn. Profile features quotes from him that "people need to run their careers like real businesses" and in speaking of entrepreneurs... "I want to know that they care about people more broadly than themselves." #21 - Josh Sapan - CEO of Rainbow Media... the umbrella company over AMC (which brought viewers "Breaking Bad" and "Mad Men") and IFC. Interesting piece for it's mention of Sapan's outside interests... including being a published poet. I gotta be impressed with a corporate exec with such a creative bent. #26 - "Shmuel "Mooly" Eden - VP/GM at Intel. Cool from the perspective of Eden's focus on consumer use of future technology. #53 - Soraya Darabi - Product Lead for Drop.io. She got the cover of this FC issue and at 23 was responsible for social media marketing at The New York Times and now at 26 helps lead the efforts of Drop.io in the field of cloud data storage and sharing. Would be fascinating to know both how she landed the gig at the NYT and what she did to be successful there. #60 - Fred Wilson - Venture Capitalist. Have heard of Wilson previously through his widely read blog A VC. Very cool this concept of transparency about what you're doing in business. #68 - Caterina Fake - Past founder of Flickr and now Hunch. I find very interesting the idea behind Hunch... basically a recommendation engine that pulls from the likes and dislikes of over 1.5 million users to help guide said recommendations. #73 - Scott Belsky - Founder and CEO of Behance... a platform designed to bring together creatives and people looking for said creative talent. FC piece includes mention of the Behance "Action Method" project management product/system/way to help get stuff done. Also from this issue, but not the 100 Most Creative list (though it seems he at least a candidate) was this short piece on Aviv Hadar... the 25 year old Portland resident behind the web design studio Think Brilliant. 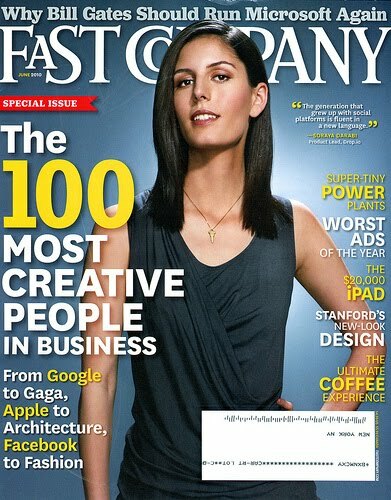 All in all, lots of really interesting stuff from Fast Company this past month.